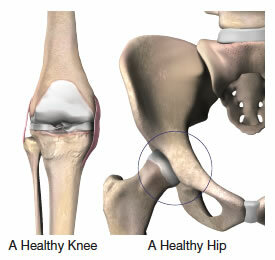 Total joint replacements of the hip and knee have been performed since the 1960s. Today, these procedures have been found to result in significant restoration of function and reduction of pain in 90% to 95% of patients.2 While the expected life of conventional joint replacements is difficult to estimate, it is not unlimited. Today’s patients can look forward to potentially benefiting from new advances that may increase the lifetime of hip and knee prostheses. Approximately one million hip and knee replacements are performed each year in the U.S.3 As successful as most of these procedures are, over the years, the artificial joints can become loose and unstable, requiring a revision (repeat) surgery. Recent improvements in surgical techniques and instrumentation can help to further the success of your treatment. The availability of advanced materials, such as titanium and ceramic prostheses and new plastic joint liners, provides orthopaedic surgeons with options that may help to increase the longevity of the prosthesis. 2. American Academy of Orthopaedic Surgeons website, accessed January 2009. 3. American Academy of Orthopaedic Surgeons website, accessed January 2009. 4. Hanssen, A.D., et al., "Evaluation and Treatment of Infection at the Site of a Total Hip or Knee Arthroplasty," JBJS, Volume. 80-A, No. 6, June 1998, pp. 910-922. Dr. George Markovich was my Orthopaedic Surgeon for TWO major hip replacements. I wanted to thank him for his wonderful results and his confident bed-side manner that made it possible for me to have the confidence to allow these surgeries. I would highly recommend him as an excellent surgeon and even more a compassionate doctor that follows through. His competent surgery has allowed me to, now, lead a normal active life at the age of 66 years, I feel better than I had in years, prior to the hip replacements.